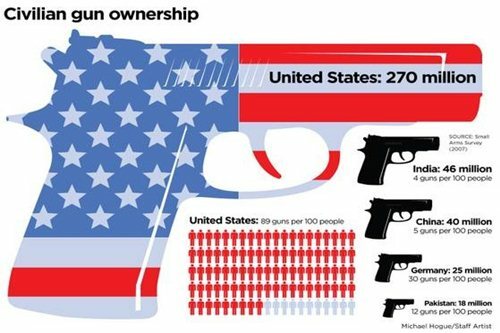 According to the World report, 270 Millions People of United states of America have their own Guns which means actually 89 Guns per 100 persons. That is the highest armed nation in the World. India has 46 Million which is 4 guns per 100 people. China own 40 Million guns which mean 5 guns per 100. Germany 25 Million, 30 guns per 100 and Pakistan 18 Millions, 12 guns per 100.